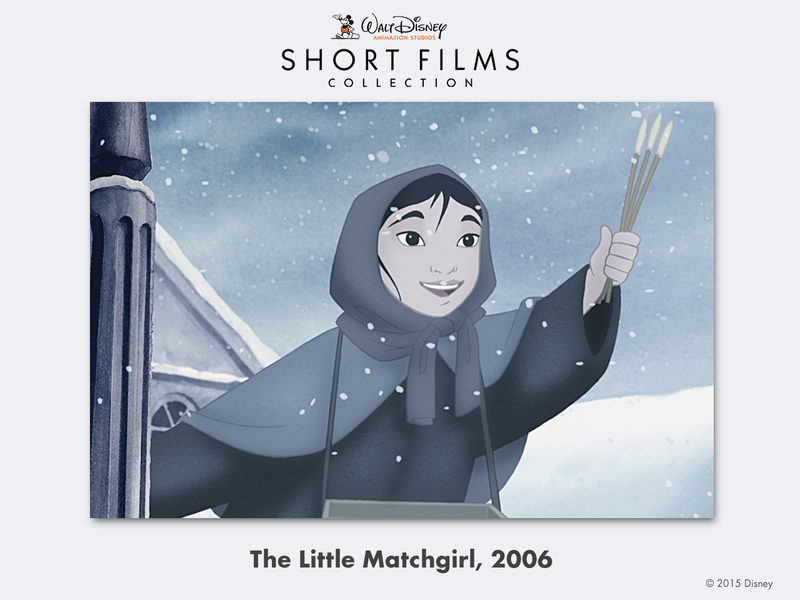 Arriving to Digital HD/Disney Movies Anywhere August 11 and Blu-ray August 18th is Disney’s Short Films Collection featuring Frozen Fever, Feast, Paperman, Tangled Ever After, The Ballad of Nessie, Tick Tock Tale, Prep & Landing: Operation: Secret Santa, How to Hook up Your Home Theater, The Little Matchgirl, Lorenzo, John Henry, Get a Horse and introductions and interviews with the acclaimed filmmakers themselves. Before you start watching this collection of some of the most beloved shorts let me give you a small piece of advice, be prepared for tears, a little confusion and a lot of cuteness. When I first watched this collection I will be honest, I had only seen six of the 12 featured: Paperman, Get a Horse, Frozen Fever, Prep & Landing: Operation: Secret Santa, Tangled Ever After, and How to Hook up Your Home Theater. I was not prepared for the emotional roller-coaster that this Short Film Collection embodied…Oh, and I do mean emotional. I still have tears in my eyes while writing this review. My suggestion, as you grab the tissues, watch John Henry and The little Matchgirl first. These two sad tales are told beautifully through hard work, love and and the desire for a better life. Both end with dreams answered but in ways that cause the tear ducts to erupt into a flowing river, much like Nessie from The Ballad of Nessie. 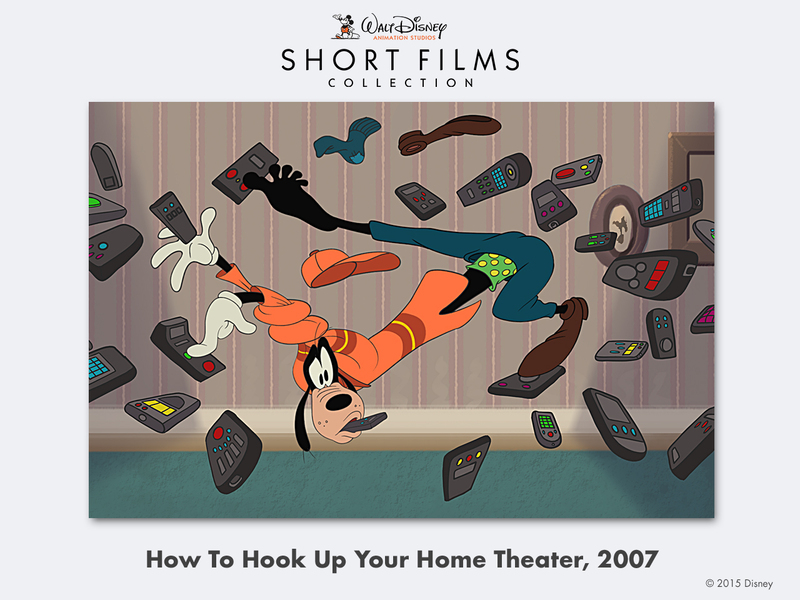 Once you get the tears of sadness out of the way, go straight to Goofy and his “How to Hook up Your Home Theater” to start the laughter flowing again. You will seriously need it. After the Goofy laugh, watch Lorenzo and get it out of the way. It may be one of their top shorts, and many people may like it, but I think I was more confused than entertained. When a spoiled cat brags about his fluffy tail it becomes hexed and develops a mind of its own. Apparently it desires to be a dancing fool that never quits. The poor cat can’t get a moments rest. We then go into a series of attempted murders, as the cat tries to kill his own tail. Yeah strange…very, very strange. Not to mention that every attempted murder seems to result in backfire. Lorenzo the cat ends up taking the blunt of the damage for each attempt, which, I suppose, is natural considering it is his tail. From the hexed tail to the attempted murders, The short left me in dismay and confusion. Not to mention it is slightly more violent than even I like to watch. 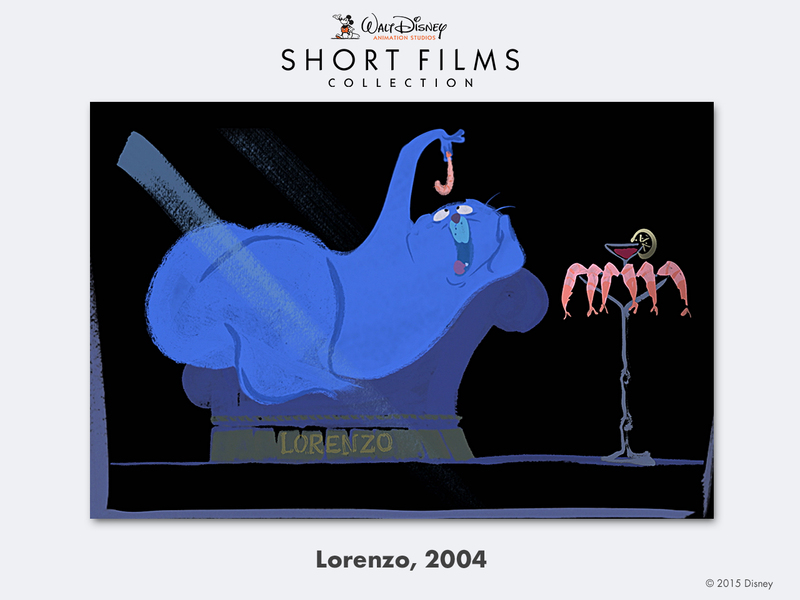 I was never more happy when “Lorenzo” was over and I could go on to a short film that would not only make me feel good but laugh as well. I guess that is why I gravitated towards “Feast” and the wonderful story of a cute dog named Winston, dogs always make me feel better. Having three rescued puppies of my own, I was excited to watch the short film. 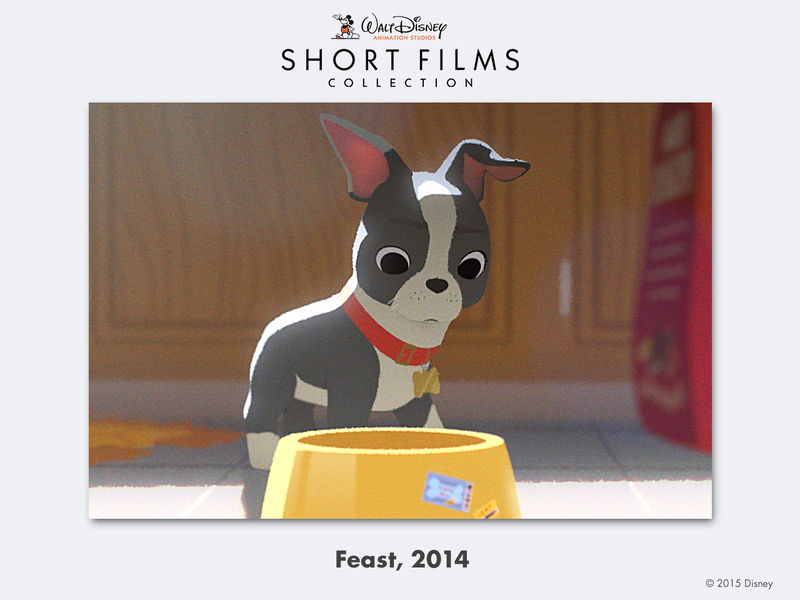 “Feast” is told through the eyes of Winston and the meals he shares with his master that rescued him. At first everything is great, Winston can expect wonderful treats and delicious food as the two grow together as bachelors. When a woman is introduced into the mix, things go a bit wonky. The food becomes more healthy, or disgusting to Winston, and it almost seems like the poor puppy is forgotten. Believe me, I was like “Oh no, please no more heartbreak,” I don’t think I could have handled it. However, the story turns when the man and woman break up and the man goes into a state of depression. At first, Winston is simply happy having all the wonderful foods again, but he soon realizes his master is not happy. Even though his life is back to being amazing with once again delicious food, Winston performs the ultimate sacrifice and thinks of his masters happiness (the tears came rolling out again). Winston runs out the door and finds his masters lost love. While his master is once again happy, it is sad to see Winston looking depressed and lost with such a lack of luster. Once again my heart was on the verge of breaking. I was beginning to lose hope in these short films. I wasn’t sure I could handle much more, than a meatball rolls across the floor. Yeah, get ready to smile as Winston once again becomes a dog. I am going to place my two cents here: Even if your life changes, you find a girl or boy, get married or have kids never forget about your dog. Their life is still just as important. They are your best friends through and through. Never allow them to lose their happiness. A dog is a family member as well. The rest of the stories are pretty straight forward with recognizable characters and fantastic themes from Santa Clause to a paper airplane helping a man find love. Not to mention questions you never thought you’d ask get answered. 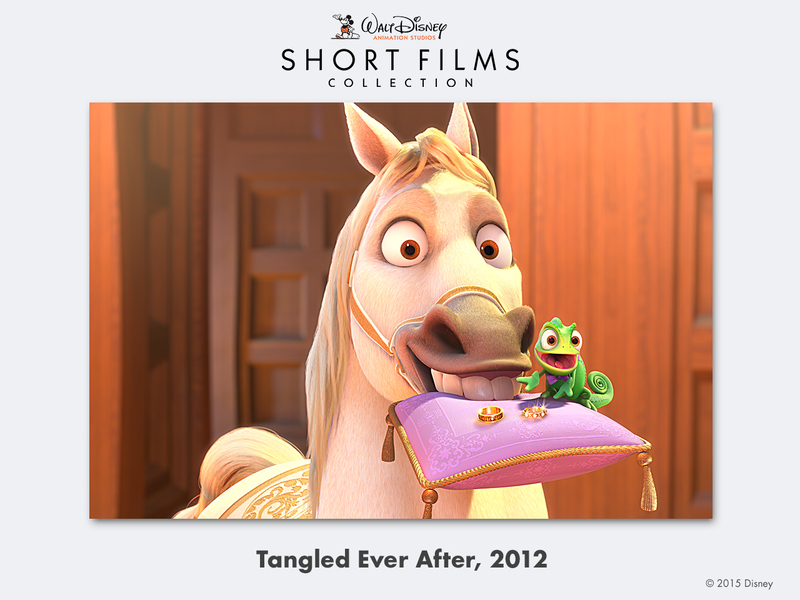 Such as, what happens when you take two rings, a spirited horse, a crazy pascal, and a wedding and throw them together? You get a Tangled Ever After with a really hilarious journey involving wine, birds, cakes, costumes and a whole lot of unfortunate events. We are also introduced to Snowman Boogies called Snowgies. Elsa catches a cold and as a result Snowgies pop out every time she sneezes, which Olaf finds absolutely amazing and names every single one of them. These short stories will definitely cause laughter and lighten up the atmosphere. No more heartbreak or sadness and no tissues needed, unless you laugh so hard you make yourself cry, which I have done. You can purchase this Walt Disney Collection of Animation Studios Short Films on Digital HD/Disney Movies Anywhere August 11 and Blu-ray August 18th. Many of them are a great addition to any Disney collection and can be watched over and over again. Head over to Amazon.com to get your copy. From Walt Disney Animation Studios comes an extraordinary collection of award-winning and beloved short films, featuring Disney’s Frozen Fever, starring Anna, Elsa, Olaf, Sven and Kristoff, and the Oscar(R)-nominated Lorenzo (Best Animated Short, 2004). 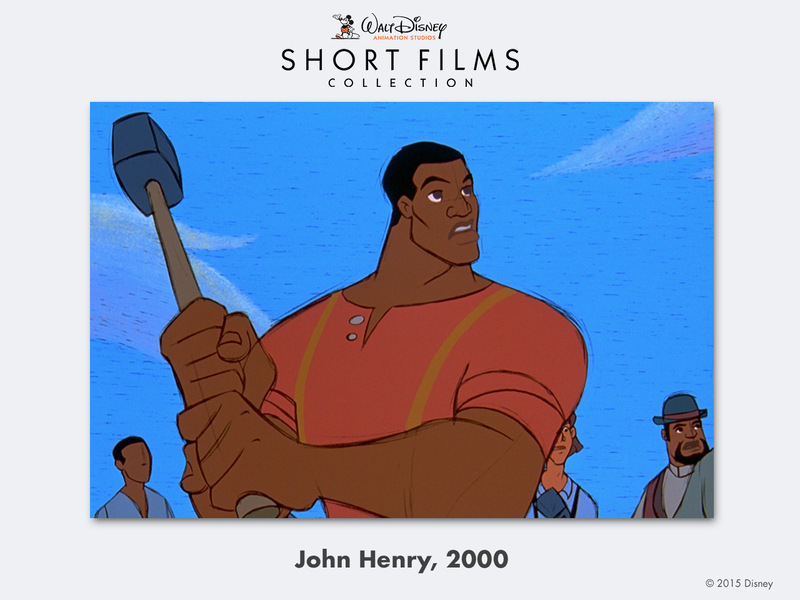 The Short Films Collection includes contemporary shorts starring classic characters, such as the groundbreaking 2013 Mickey Mouse cartoon Get A Horse! and the holiday treat Prep & Landing–Operation: Secret Santa, as well as celebrated Oscar winners Paperman (2012) and Feast (2014). Enjoy them together in this one-of-a-kind collection, featuring introductions to the shorts by the acclaimed filmmakers themselves.